Adults aren’t the only ones that can have trouble from tooth decay. It can bother toddlers too. When a toddler or infant has tooth decay, it is often called Early Childhood Caries or Baby Bottle Tooth Decay. In order to have a beautiful smile, speak clearly and chew their food properly, children need to have healthy teeth. The state of their adult teeth is also partially determined by the baby teeth. For this reason, make sure to start your children with excellent oral hygiene habits to prevent tooth decay in toddlers. What Causes Toddler Tooth Decay? While other teeth can be affected, tooth decay is more common in the upper front teeth. There are many things that can contribute to tooth decay. One of the most common one is when the baby teeth are exposed to sugary drinks for prolonged periods. Decay has also been known to happen with babies who get a bottle when put to bed. Cavity-causing bacteria are what start the tooth decay and these bacteria can even be passed from the mother or other major caregiver to the baby. The bacteria can be passed through saliva when a mom puts a pacifier or spoon in her mouth and then places it back in the baby’s mouth. Tooth decay is also linked to an infant not getting enough fluoride, therefore increasing the tooth decay risk. Luckily, toddler tooth decay can be treated and prevented. How Can Toddler Tooth Decay Be Treated? The treatment for your child will vary according to many different things, such as your child’s age and the condition. The earlier you and your dentist can catch it, the better management plan you can formulate. Have less juice intake, specifically citrus juice. Swap out water for juice, milk or even formula in your child’s bottle. Any of the above changes should only be made under the supervision of your pediatrician. Depending on the age of your child, some of these changes may not be recommended. Irritability, swelling or fever which may indicate infection. If you notice any of these symptoms, it’s important to visit your dentist immediately. Once decay has spread, your child may need extensive restoration or suffer from tooth loss. The treatment for decay in toddler teeth is similar to that in adult teeth. Stainless crowns are often used, according to the American Academy of Pediatric Dentistry, because they are less likely to need further work due to being so durable. Sedation and general anesthesia may be recommended with extensive work. There are some cases where the teeth may need to be extracted, but it is more likely with extensive decay or infection. People often think that since the toddlers will lose their baby teeth, treatment isn’t important, but this is a misconception. There are many reasons you should seek treatment right away when you discover tooth decay in your toddlers. Your child’s adult teeth that need to last through the entire life, are already in the jawbone of your toddler. The baby teeth hold their place and if they prematurely are lost, spacing can be negatively affected. This can cause many issues, including misalignment of permanent teeth and even extensive orthodontic treatment. With tooth loss, your child may also find it difficult to eat a quality diet or have trouble speaking properly. Correct diction requires two front teeth, so with premature loss, your child may need speech therapy. Luckily, there are some things you can do to help stave off tooth decay. Remember, good oral hygiene is critical. Wiping your infant’s gums with clean washcloth or gauze after a feeding. Start brushing teeth (but don’t use toothpaste) as soon as they come in. 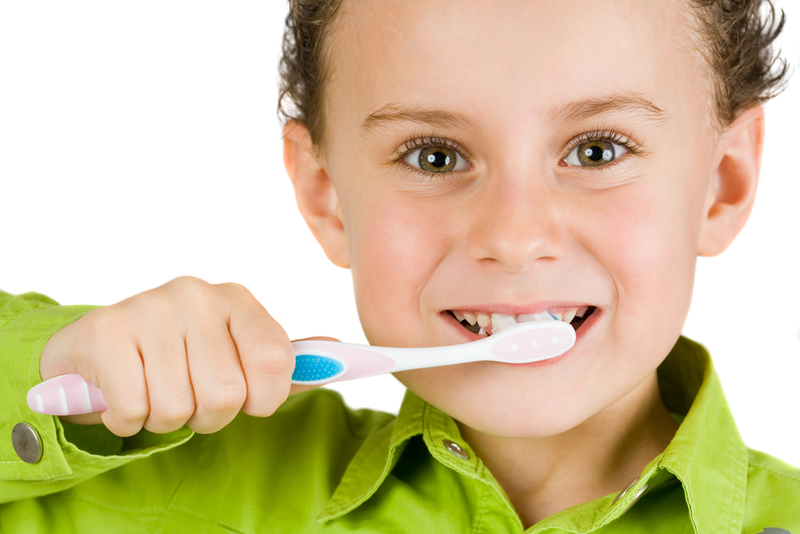 If using toothpaste, make sure it is age appropriate and fluoride-free. Massage and clean the gums that don’t have teeth. Start flossing when teeth come in. Make sure there is an adequate source of fluoride for your child. If your water doesn’t have it, you should ask your doctor or dentist for a supplement. Start dental appointments as early as their first birthday. They can provide sealants that will protect against tooth decay. Keep bottles for milk, formula, water or medicinal solutions; don’t fill them with soft drinks or sugar water. If your child won’t try the sippy cup, you can use watered down juice to draw interest. Soft drinks should be avoided as there is nothing of value in them. Don’t put your child to sleep with anything but water. Don’t dip pacifiers in sweets. Try to keep sugar out of your child’s diet, especially as snacks.